This entry was posted in Factoid on September 17, 2013 by aquifer. Two bicyclists start twenty miles apart and head toward each other, each going at a steady rate of 10 mph. 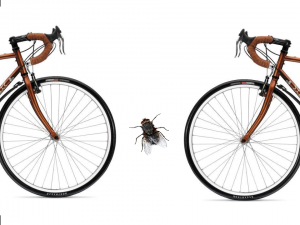 At the same time a fly that travels at a steady 15 mph starts from the front wheel of the southbound bicycle and flies to the front wheel of the northbound one, then turns around and flies to the front wheel of the southbound one again, and continues in this manner till he is crushed between the two front wheels. Question: what total distance did the fly cover?